This is a “budgie baby page” — we put one of these together for each season’s budgie parakeet chicks so our adopters can ooh and aah over all the cuteness while they wait to bring their feathered friend(s) home. If you’d like to be added to our waiting list for a chick of your own, please visit our breeding info page for details! Tiny babies hatch from tiny eggs. We let momma bird feed them in the nest for the first 2-3 weeks, then we take over with around-the-clock handfeeding so they grow up tame, tame, tame! 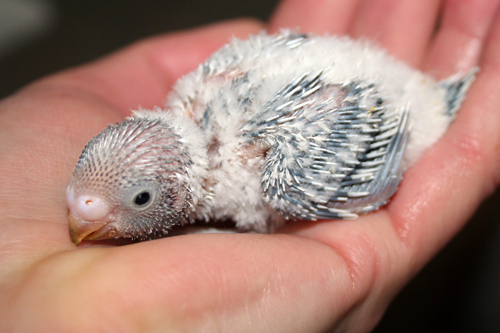 Handfeeding parakeets starts at 14-21 days of age but we start handling the chicks in the nest even before then. 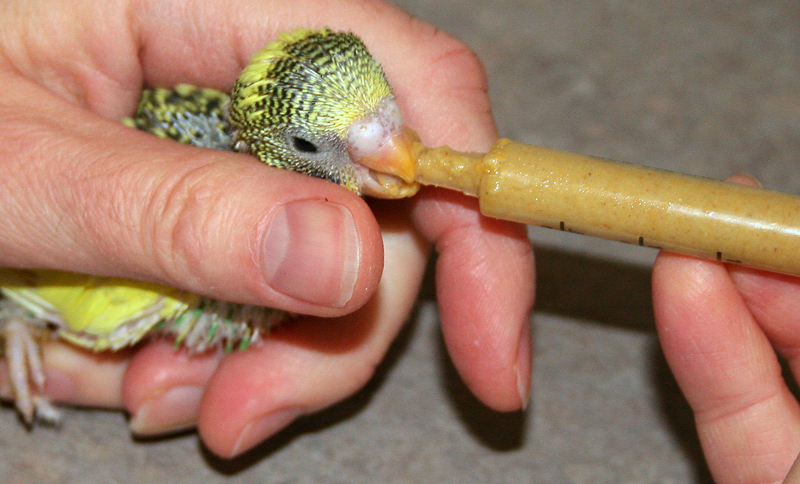 Handfeeding parakeet babies is a HUGE time commitment. By the time they’ve weaned, we’ve fed them by syringe at least 112 times! 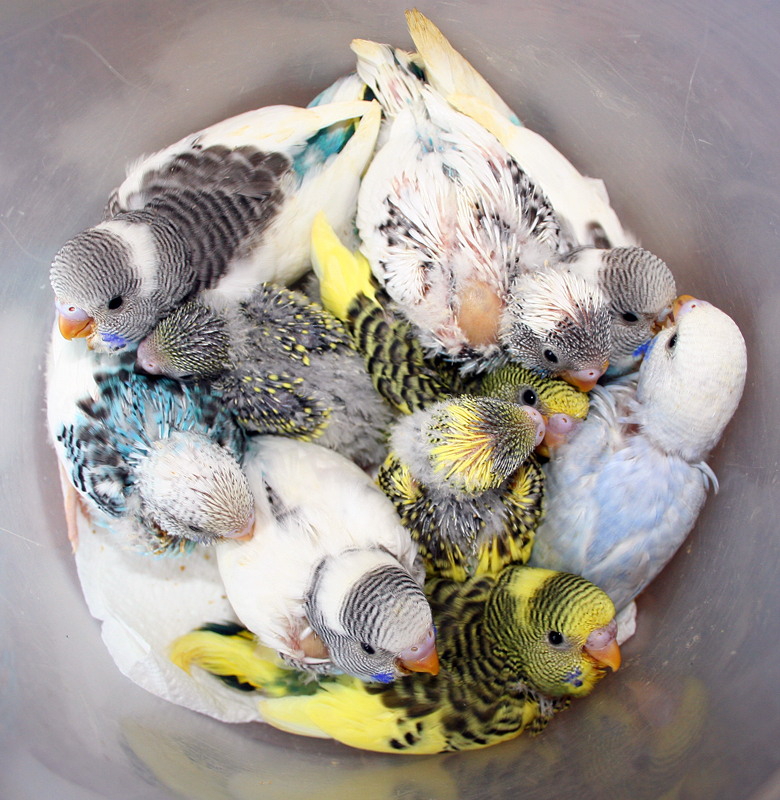 A bowl full of budgie babies! When they were younger, after each hand-feeding, they enjoyed snuggling up with a full belly (crop) to keep warm. 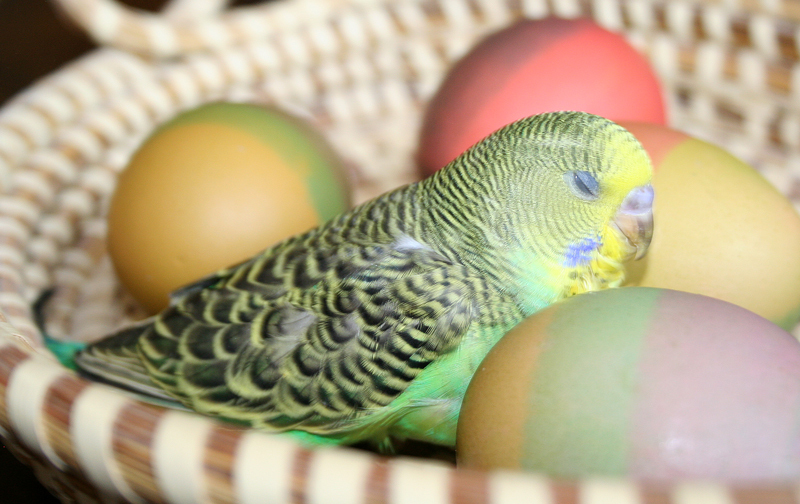 “Peanut”: normal green parakeet (split for white-base, opaline and greywing) male, 4 wks old on Easter. Sopping wet after a bath! Hand-feeding formula is messy stuff and needs to be washed off occasionally. The babies enjoy a fine mist of warm water from a spray bottle and/or a warm trickle of water in the sink to splash around in. 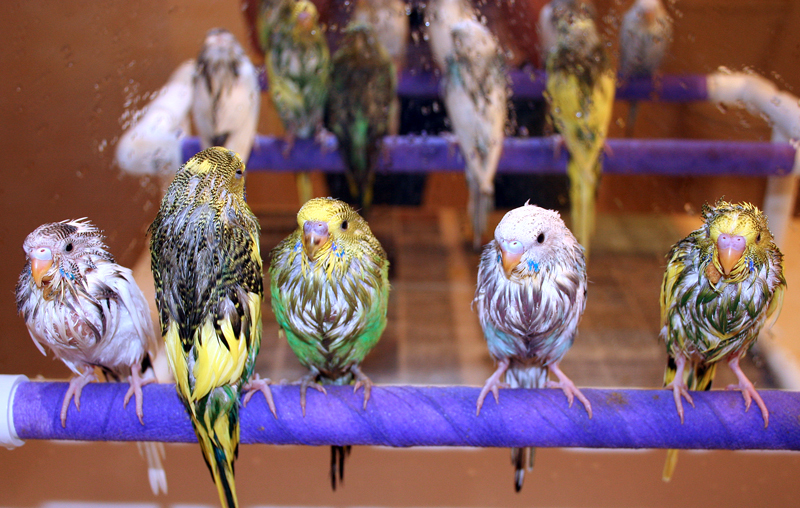 Perch training the parakeets as they dry off in a warm room after their bath. “Are you talking to me?” “Tuxedo”: dark green dominant pied (split for white base, opaline and greywing) male. 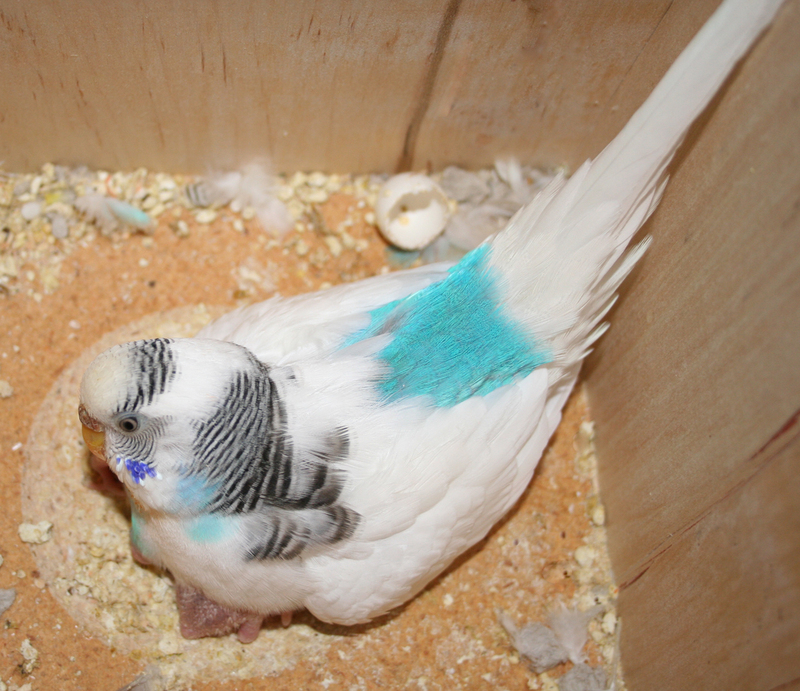 “Paisley”: opaline skyblue clearflight (split for greywing) female. Very relaxed and comfortable upside down in my hand — evidence of trust and bonding! Handfed babies LOVE people! The babies are curious, landing on people’s heads, giving kisses, preening hair. 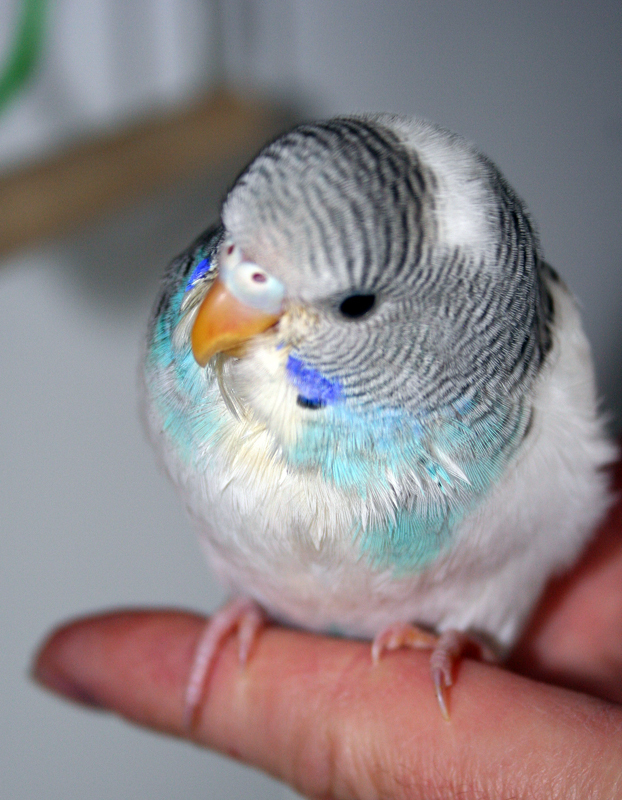 “Mostly Cloudy”, Mom to the 4 skyblue pied babies, is a double-factor dominant pied. “Mellow Yellow” (below) is the proud poppa. “Mellow Yellow”, a full-body-color light-green greywing (split for white-base), was paired with “Mostly Cloudy” above. Pictured here is Dad “Skylar” (a violet-skyblue clearflight opaline, split for greywing) and Mom “Mountain Dew” (light-green greywing, split for white-base). They hatched 6 babies: 2 male dark-green dominant pieds split for white-base, opaline and greywing; 1 male light-green dominant pied split for white-base, opaline and greywing; 1 female opaline dilute violet-skyblue greywing; 1 female opaline skyblue clearflight pied split for greywing; 1 male green normal split for white-base, opaline and greywing. 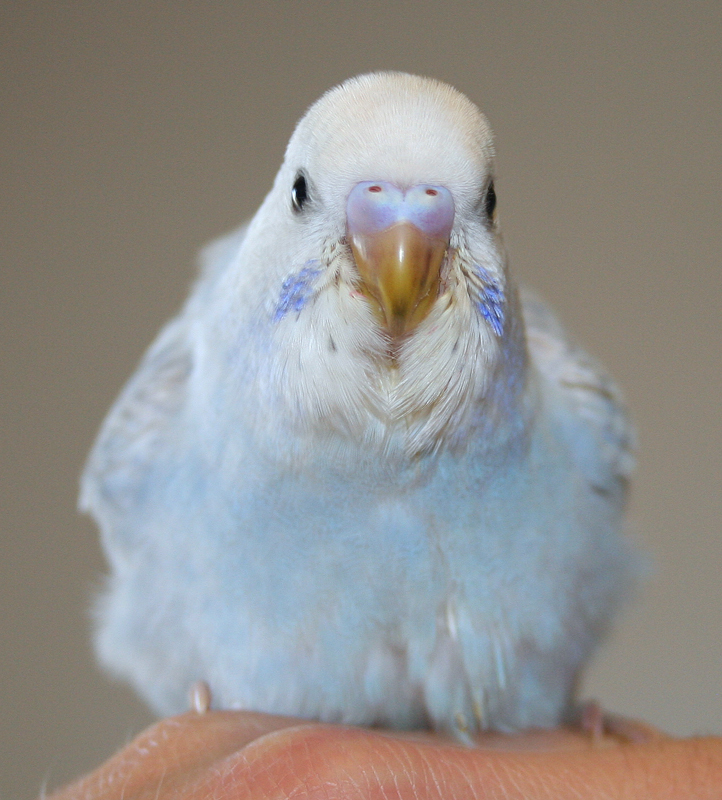 The chicks on this page were born in the spring of 2010 and have been adopted already so after you are done drooling, click here to see the parakeets who are currently available! 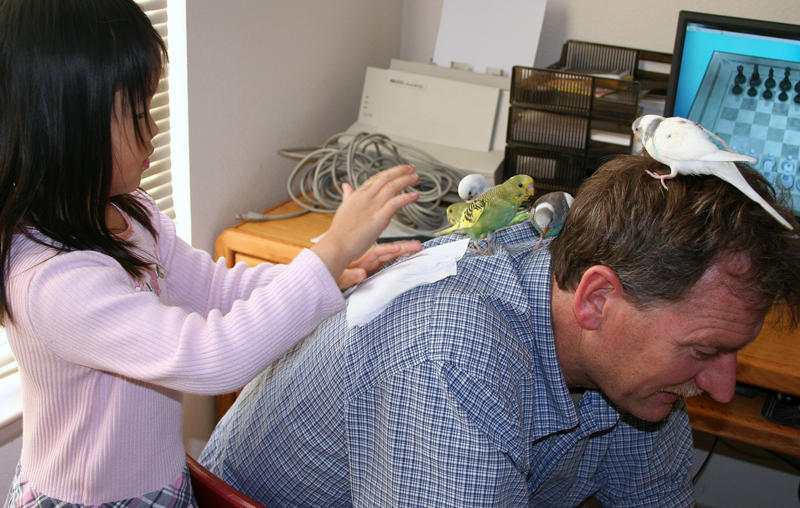 Hand-fed Budgies and Parakeets available in Colorado! 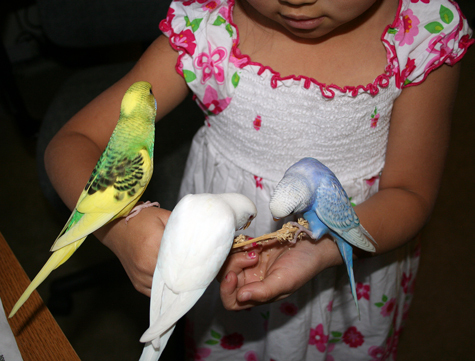 : Our family raises, hand-feeds, trains and adores Budgie Parakeets. Learn more about our selective breeding program and view our gorgeous, tame birds. Inside Our Aviary: See where our birds live — flight enclosures, breeding room, play gyms. 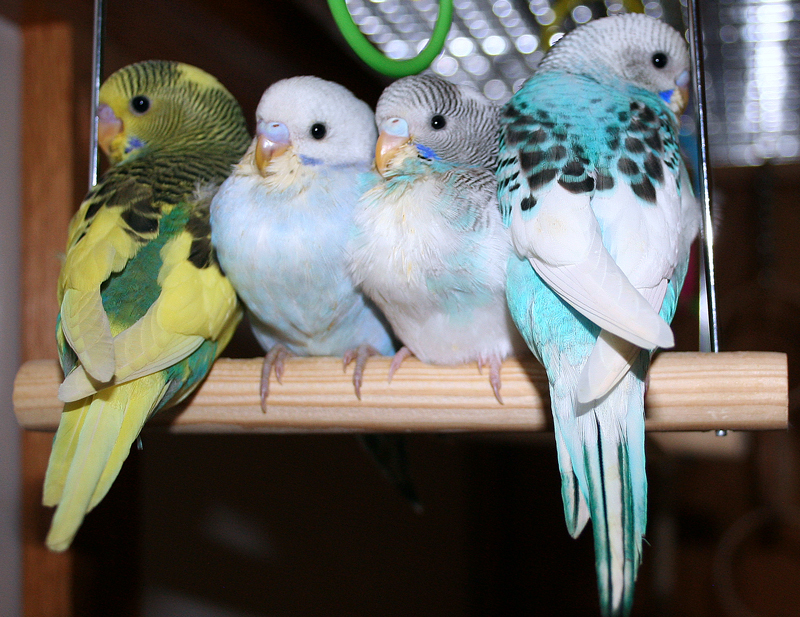 Our Flock of Adult Budgie Parakeets: Take a peek at our gorgeous feathered friends. Lots of photos! Adorable Pictures of Our Hand-fed Babies: Come ooh and aahh over all the cuteness and watch them grow up! Pre-Adoption Questionnaire: If you are interested in adopting one (or more) of our parakeets when they become available, please respond to these questions. 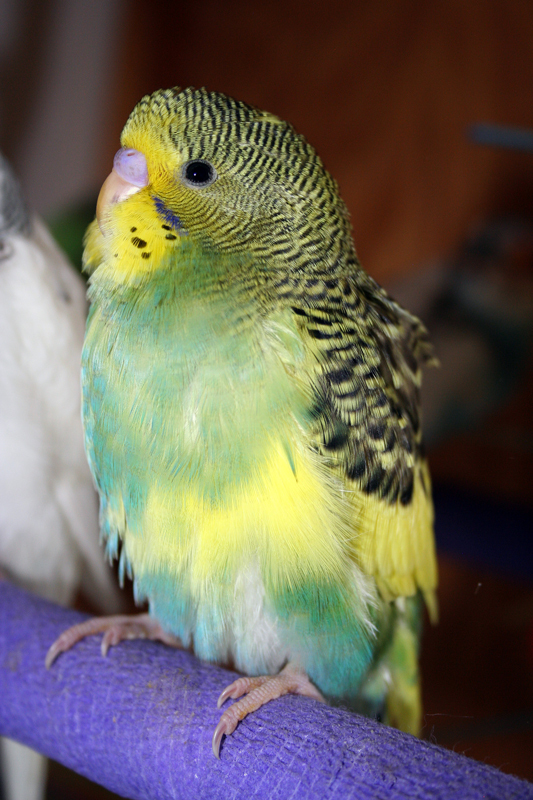 Budgie Baby Waiting List: I know how hard it is to wait when you’re excited but I promise you, the wait is worth it! 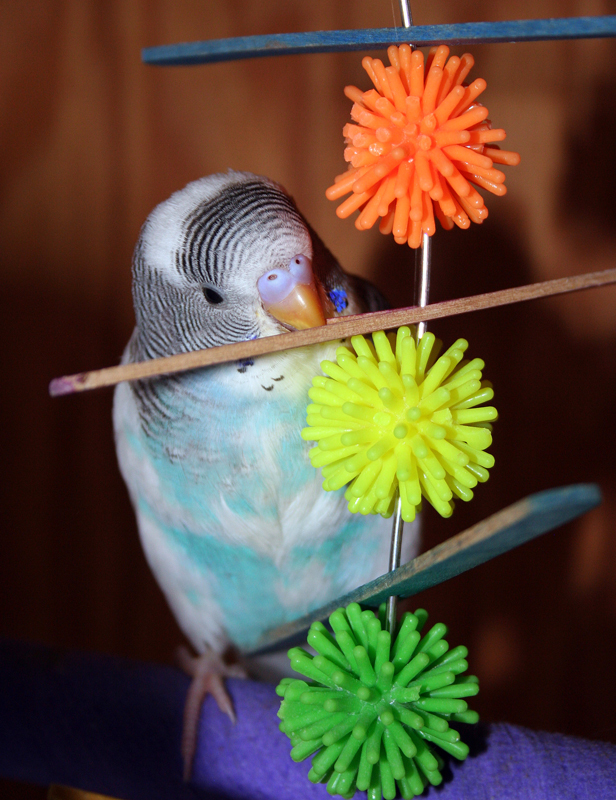 FAQ (frequently asked questions): What is a Budgie Parakeet’s personality like? 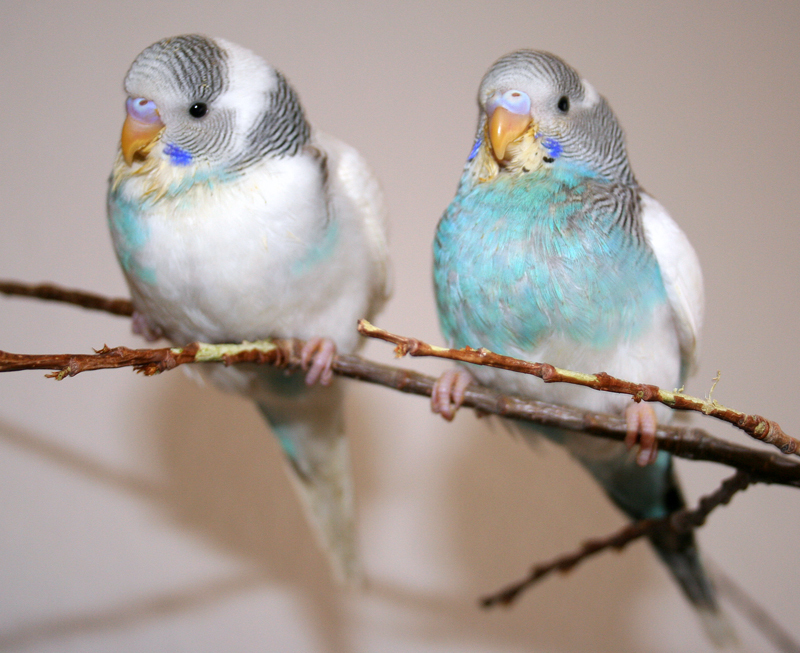 What are the differences between American Parakeets and English Budgies? How do you tell a male from a female? Should you keep one, two or more? How long do they live? Where did the species originate? 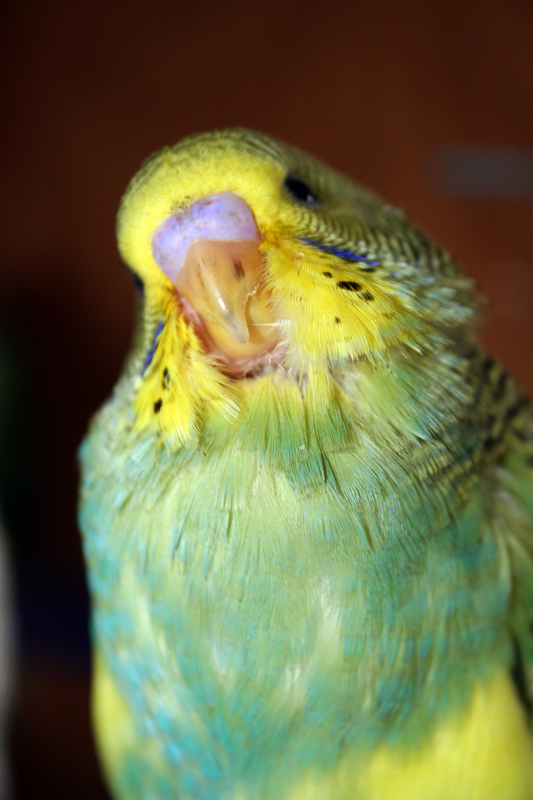 How To Care For Your Pet Budgie Parakeet: Learn about housing, cages, homemade aviaries, cleaning tips, health, safety, nutrition, exercise, playtime activities, toys, and more. Bird Nutrition and Food Recommendations: Malnourishment is a leading cause of premature death in pet birds. We provide lists of healthy foods, and tell you how to grow your own sprouts. Training, Talking, Tricks: Entertaining video demonstrations and informative tips. 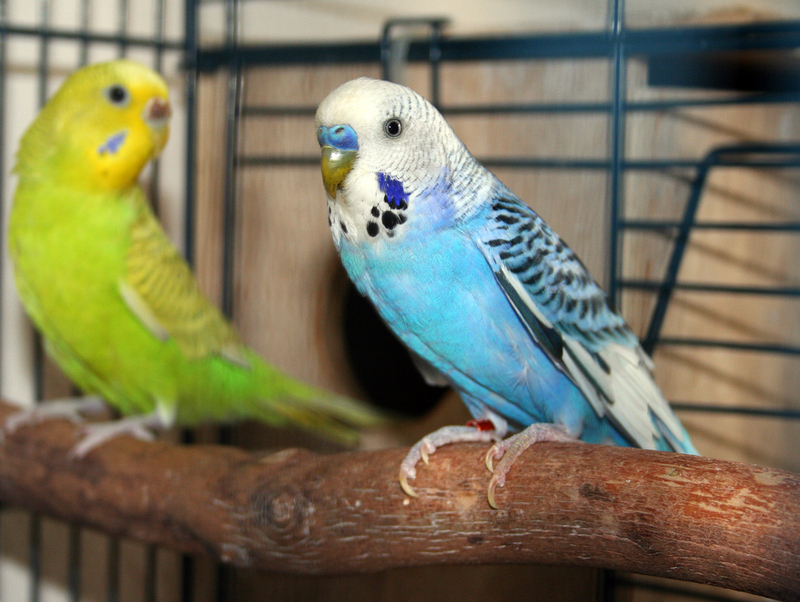 Colors, Varieties, Mutations, Genetics: Budgie Parakeets come in a rainbow of colors. This page has beautiful photos and variety descriptions. 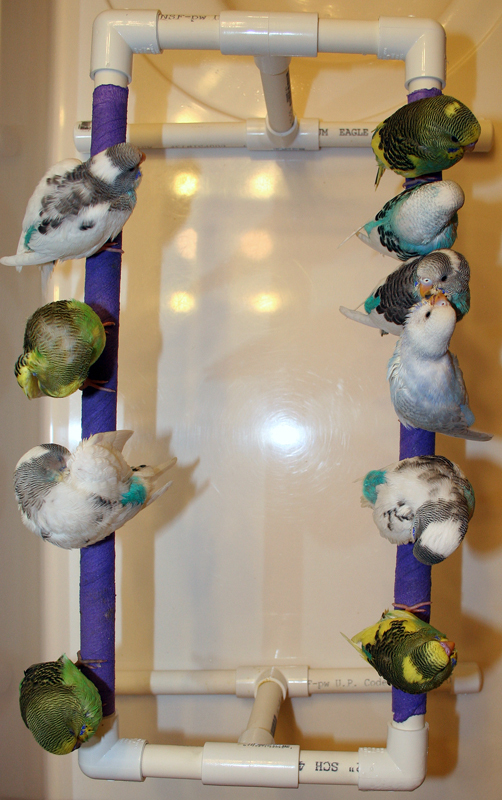 Bird and Parrot Playgyms, Stands and Perches for Sale: Learn how to make your own — or order a custom one from us. Homemade Aviaries and Flight Cages: How to converted used furniture into large flight cages and beautiful indoor aviaries. Respond to our pre-adoption questionnaire. Email your responses to: Jen @ puppies are prozac . com (remove all spaces in the address first). Upon approval of your questionnaire responses, I will add your name to the waiting list. As soon as we have 3 week old chicks in the brooder for hand-feeding, I will email you (in the order of your waiting list date) and request a $15 (each chick) non-refundable deposit to reserve your hand-fed baby. 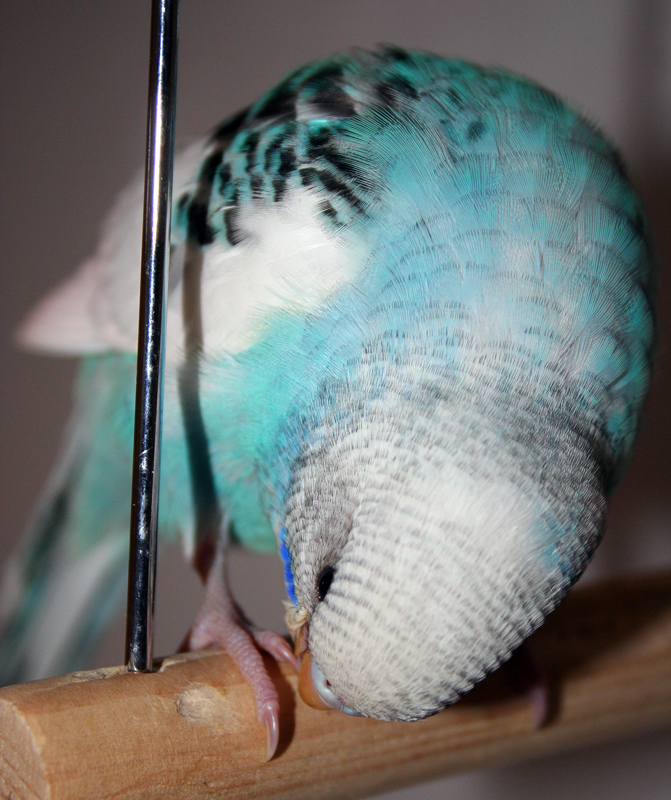 While you’re waiting for your parakeet(s) to be hand-fed then weaned onto solid foods, please read our parakeet care information page, prepare a cage with the specifications outlined on that page, and purchase some appropriate budgie parakeet food. 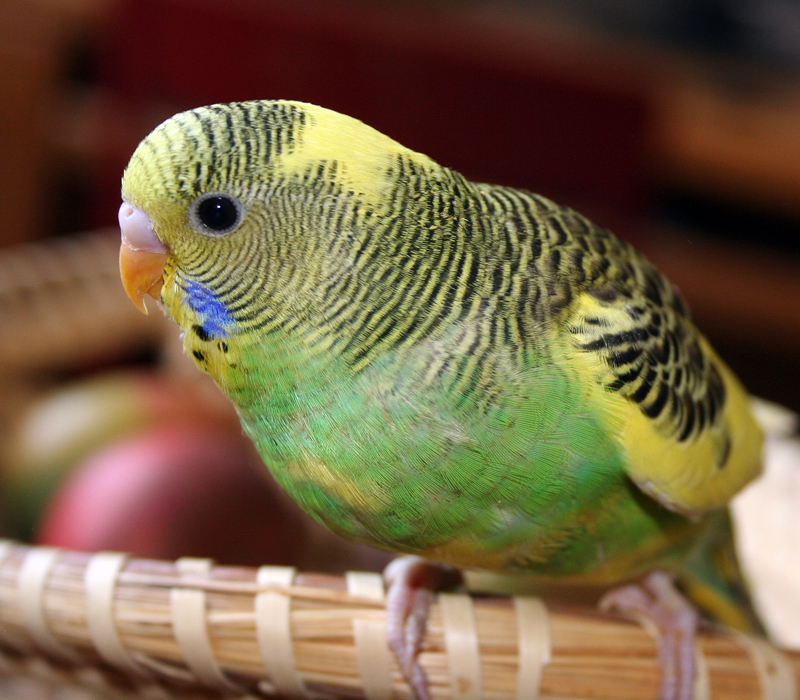 Most parakeets are weaned and ready to move to new homes when they are about 6 weeks of age. Sorry, no shipping. Pick up is in Fort Collins, Colorado. I am wondering if you have any parakeets available for purchase now or in the nex few weeks? We would be interested in two. Connie and Robin — These babies have all gone home to their new families. We do have a very pretty breeding pair set up right now and I can put you on the waiting list for two from them if you’d like. Hopefully we’ll see eggs soon — then they incubate them for 3 wks, then feed them for 2 wks, then we pull them from the nest and handfeed for about 4 wks. (So hopefully in 9 wks, we’ll have babies ready for new homes again.) 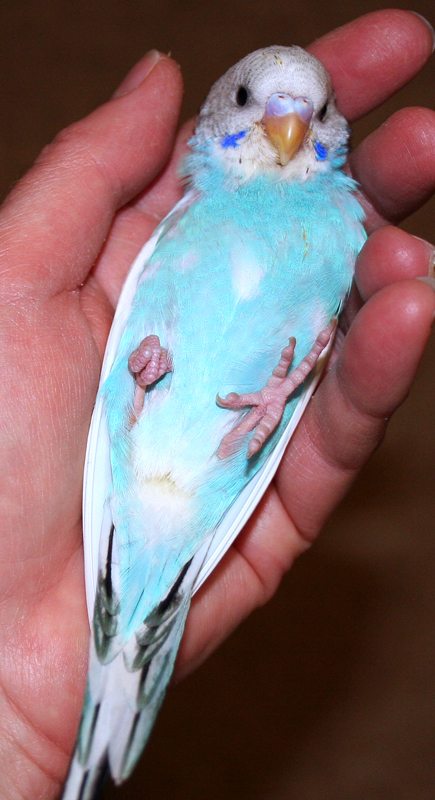 The hen is a gorgeous yellow-faced cobalt blue (might have violet factor in her) clearflight opaline. She has an excellent temperament. 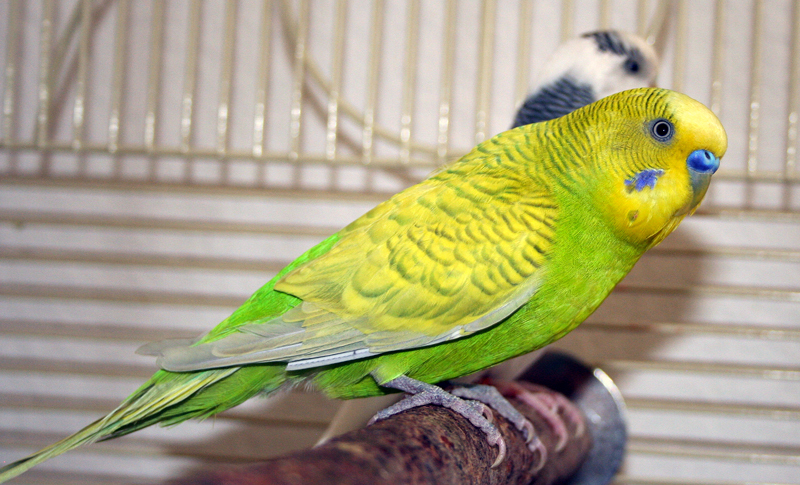 The male is a yellow-faced turquoise blue with normal wing markings. He is a bit larger and also has a great temperament. Let me know if you’d like to be put on the waiting list! Good morning! I am trying to find out of you still have any of the baby budgies left. I am looking to secure two birds that are well socialized and used to human contact. Please email me and let me know if you have any left. I have family that is close to Estes Park, so pick up would not be an issue. Hi 🙂 your pictures are so cute! id loved to be on the waiting list for the next availible male that looks like skylar!! how soon!? I will email you more info and our pre-adoption questionnaire. Hi, your birds are beautiful! We are looking for a hand raised parakeet. Do you have any coming available? Thanks..
We’ll put 3 pairs together later this week. Babies are ready for homes about 9 weeks after eggs are laid. Try to be patient — the handfed babies are worth the wait! So sweet and loving; you’ll have a great family pet for up to 15 years! In the meantime, check out our care information, resources and links on our website: http://puppiesareprozac.com/budgie-parakeet/care-articles-links/. Also, please respond to the pre-adoption questionnaire, below. Thanks! If you are interested in adopting one (or more) of our handfed parakeet babies when they become available, please fill out the following questionnaire. Don’t worry about answering all of the questions “correctly” because I am more than happy to discuss any of them with you; view this as a conversation starter so that together, we can ensure that your feathered friend enjoys a long, healthy life with you and your family. How (or where) did you learn about our handfed parakeets? Is this parakeet(s) intended for children under age 18? If yes, how old are your children? Who will be responsible for daily cage cleaning? Daily feeding? Daily play time, love and attention? Who will purchase the cage, toys and food? Pay for veterinary care if needed? What, specifically, are you interested in adopting (adult / baby in current clutch / be added to the wait list for a future clutch)? How many? Do you have any other pet birds at this time? If yes, what species? Gender? From where did you obtain them? If no, are you new to pet birds? If for some unknown reason you could no longer keep the parakeet(s), where would the bird(s) go? Do you plan to breed your parakeet(s)? If you are a breeder, what are your goals and how can I help you reach your goals? Where do you intend to keep your bird’s cage? Parakeets are like curious 2-4 year old children. They love to play and explore. Please describe how you plan to keep your bird(s) safe whenever they spend time outside of their cage. Do you have any other thoughts you’d like to share? Do you have any questions you’d like to ask? I was wondering if you could help me with our parakeet female 3 years old, she is having laborous breathing, bobbing tail, no energy, but still eating and no loss of appetite or discharge, I don’t want to treat with an antiobiotic if there is a natural remedy is there something you could recommend I purchase or something natural from the health food store? Whenever I notice a bird acting sluggish, I put it immediately into a brooder/hospital cage where it can stay warm and I can keep an eagle-eye on it. If she acts this way for more than half-a-day with no improvement, I would take her to an avian vet specialist. Birds go downhill very quickly! I create a hospital cage by placing a ventilated plastic tote w/ perch over a heating pad wrapped in a towel. Put food and water in there, too. My little birdy passed away today he was so cool. He was hand fed, his name was birdy because he always talked about birdy. He lived to be 8 years old. 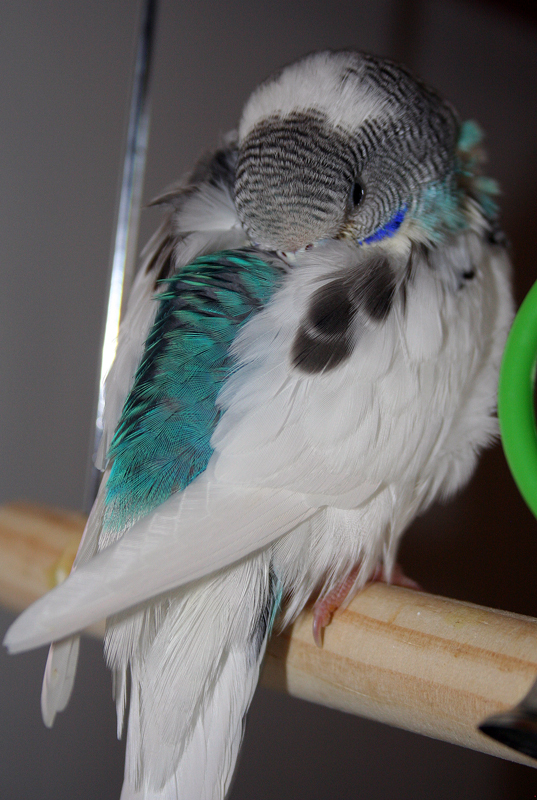 I love the pictures of your birds and wished I live close to you so I could get another hand fed budgie. I live in Boise Idaho so it’s really hard to get a hand fed budgie. I waited a year for birdy. 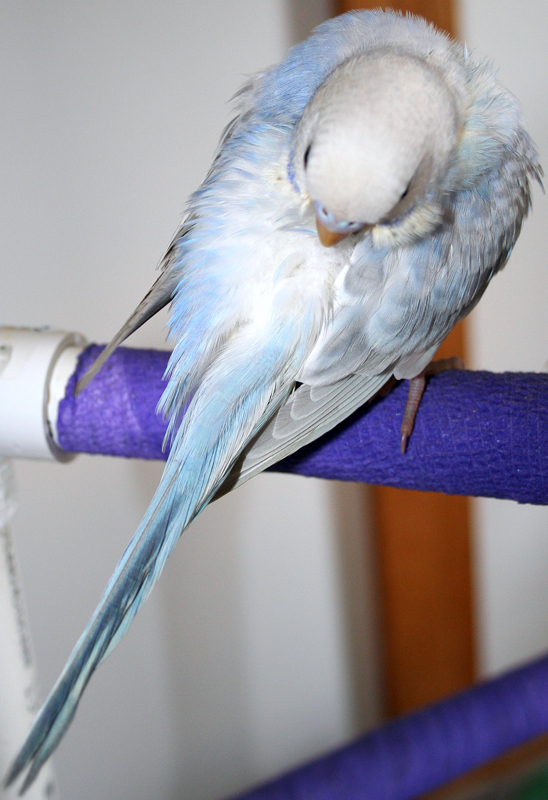 Do you have any ideas or info on how to get another hand fed budgie in Boise because I sure miss birdy … He was my friend. Sorry for your loss. Unfortunately, I don’t know any breeders in your area. Try asking your local avian veterinarians for referrals.